Friendswood City Council recognized the following members of the Friendswood Police Department and the Friendswood Volunteer Fire Department/EMS for their vital assistance managing a pediatric patient they responded to on January 6. Happy Holidays from the FVFD! 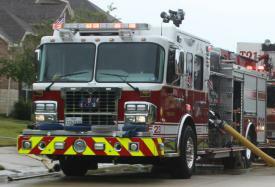 There’s a new, half-million dollar fire truck on the way to Friendswood that will be paid for $6 at a time. During their November meeting, Councilmembers unanimously approved the purchase of a 2019 Spartan 4-door, custom full-tilt, aluminum cab fire truck with a price of $579,153. It will be funded through the $6 donations that residents add to their utility bills every other month.